Justices, in a 7-2 decision released Monday, overturned the 2011 conviction of Anthony Douglas Elonis on charges of using interstate commerce to threaten another person with injuries. Elonis was sentenced to 44 months in prison on four counts. Using the pseudonym Tone Dougie, Elonis posted violent lyrics by rapper Eminem as well as his own fantasies about killing or injuring his wife and other people. In one post, Elonis wrote: "I'm not going to rest until your body is a mess, soaked in blood and dying from all the little cuts." 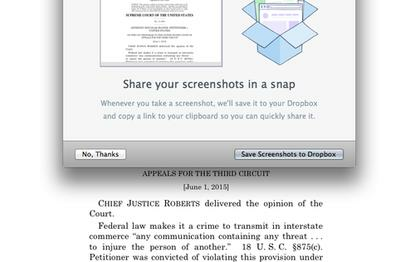 But during Elonis' trial, the U.S. District Court for the Eastern District of Pennsylvania failed to consider the defendant's intentions for the Facebook posts, Supreme Court Chief Justice John Roberts wrote for the majority. The lower court told the jury that prosecutors needed to prove only that a reasonable person would regard Elonis' posts as threats, but the court should have also considered his "mental state," Roberts wrote. Elonis' "material was often interspersed with disclaimers that the lyrics were 'fictitious,' with no intentional 'resemblance to real persons,'" Roberts wrote. "Elonis posted an explanation to another Facebook user that 'I'm doing this for me. My writing is therapeutic.'" Elonis' lawyers argued his Facebook posts were a way to vent his frustrations about the break-up with his wife and protected as free speech, but prosecutors said his comments were often targeted at specific people. About a female FBI agent who investigated the posts, Elonis wrote: "Little Agent Lady stood so close; took all the strength I had not to turn the (expletive) ghost; pull my knife, flick my wrist, and slit her throat." A post about nearby elementary schools: "Enough elementary schools in a ten mile radius to initiate the most heinous school shooting ever imagined."